New water purification process is a potential boon to developing countries as well as soldiers and campers The simple new approach combines bacteria-produced cellulose and graphene oxide to form a bi-layered biofoam and is powered by the sun. .
Graphene oxide has been hailed as a veritable wonder material; when incorporated into nanocellulose foam, the lab-created substance is light, strong and flexible, conducting heat and electricity quickly and efficiently. Now, a team of engineers at Washington University in St. Louis has found a way to use graphene oxide sheets to transform dirty water into drinking water, and it could be a global game-changer. An artist's rendering of nanoparticle biofoam developed by engineers at Washington University in St. Louis. The biofoam makes it possible to clean water quickly and efficiently using nanocellulose and graphene oxide. A paper detailing the research is available online in Advanced Materials. “The process is extremely simple,” Singamaneni said. “The beauty is that the nanoscale cellulose fiber network produced by bacteria has excellent ability move the water from the bulk to the evaporative surface while minimizing the heat coming down, and the entire thing is produced in one shot. “The design of the material is novel here,” Singamaneni said. “You have a bi-layered structure with light-absorbing graphene oxide filled nanocellulose at the top and pristine nanocellulose at the bottom. When you suspend this entire thing on water, the water is actually able to reach the top surface where evaporation happens. The cellulose at the bottom of the bi-layered biofoam acts as a sponge, drawing water up to the graphene oxide where rapid evaporation occurs. The resulting fresh water can easily be collected from the top of the sheet. The process in which the bi-layered biofoam is actually formed is also novel. In the same way an oyster makes a pearl, the bacteria forms layers of nanocellulose fibers in which the graphene oxide flakes get embedded. “While we are culturing the bacteria for the cellulose, we added the graphene oxide flakes into the medium itself,” said Qisheng Jiang, lead author of the paper and a graduate student in the Singamaneni lab. The new biofoam is also extremely light and inexpensive to make, making it a viable tool for water purification and desalination. The Energy Department's Office of Energy Efficiency and Renewable Energy today announced a total of $11 million for 16 projects intended to develop innovative, early-stage solutions in both photovoltaics (PV) and concentrating solar power (CSP). Ten of the projects are small-scale research and development (R&D) projects designed to push the limits of PV technologies, potentially advancing the state of the art in new cell and module architectures, efficiency, energy output, service lifetime, and manufacturability. These awardees will be funded under the Small Innovative Projects in Solar (SIPS) program developed to support progress toward leveling the cost of solar electricity to approximately $0.02 to $0.03 per kilowatt-hour by 2030. 2014 was the largest year ever in the U.S. for CSP--more than 767 megawatts of new CSP generation came online with the completion of Ivanpah, Genesis Solar’s second phase, and Abengoa’s Mojave Solar. SolarReserve’s 110 MW Crescent Dunes, is the next U.S. plant slated to come online in early 2016. The small, early-stage PV projects will receive nearly $2 million to demonstrate the potential for expanded work in novel or emerging areas of PV research. These first-of-their-kind, single-year projects in the SunShot Initiative's PV R&D portfolio are designed to allow researchers to test a concept and, if successful, develop data to support further research. This approach allows researchers to take a year to demonstrate that their ideas merit greater investment in the future. The other six awardees are CSP R&D projects focused on the most expensive component of a CSP plant, the collectors, and aim to make dramatic performance improvements and cost reductions. The Concentrating Optics for Lower Levelized Energy Costs (COLLECTS) program targets a more ambitious cost-to-efficiency metric for CSP collectors than what was set forward in the 2020 SunShot targets. Solar collectors currently account for up to 40 percent of the total plant cost and are the largest capital cost component of a CSP plant. These six CSP awards through SunShot's COLLECTS program total nearly $9 million dedicated to the design and manufacture of lower-cost solar collectors, which could in turn reduce the overall cost of a CSP power plant. The SunShot Initiative supports research and development of concentrating solar power(CSP) technologies that reduce the cost of solar energy. CSP helps to achieve the SunShot Initiative cost targets with systems that can supply solar power on demand, even when there is no sunlight, through the use of thermal storage. Since SunShot’s inception, the levelized cost of electricity for CSP has decreased about 36 percent, from $0.21 cents per kilowatt hour to $0.13 cents per kilowatt hour, already over half of the way toward achieving the SunShot goal of $0.06 per kilowatt hour by 2020. Since its launch in 2011, the SunShot Initiative has been focused on driving down the cost of utility-scale solar to $0.06 per kilowatt-hour by 2020, without subsidy. These new programs, developed within the SunShot Initiative, provide a framework for post-2020 technical and cost-reduction goals. The Energy Department's SunShot Initiative is a collaborative national effort that aggressively drives innovation to make solar energy cost competitive with traditional energy sources before the end of the decade, without subsidies. The Office of Energy Efficiency and Renewable Energy works with private industry, universities, and national laboratories to accelerate the development and deployment of energy efficiency and renewable energy technologies that strengthen U.S. energy security, environmental quality, and economic vitality. The discovery could explain the repeated – and costly – failure over the last 20 years of clinical trials of potential pain-killing drugs that targeted the substance, known as ‘Substance P’. Substance P is produced in both the central nervous system (CNS) – the brain and spinal cord – and in our peripheral nervous system (PNS) – all the other nerves and nerve cells that send signals to the brain. The new research, by the Hebei Medical University in China and the University of Leeds in the UK, has found that, in the peripheral nervous system, Substance P makes nerve cells less responsive and excitable, thereby reducing sensations of pain. This is in direct contrast to its role in the central nervous system, where it triggers very different signals, exciting neurons and so promoting pain. Lead researcher Professor Nikita Gamper, from the University of Leeds, explains: “We were really surprised by the results – Substance P is described in the literature as a molecule that gets nerve cells excited and promotes pain. But we’ve discovered a paradox – that in the peripheral nervous system it acts as one of the body’s natural painkillers and actually suppresses pain. Substance P works in the peripheral system by modulating the action of certain proteins that control the ability of pain-sensing neurons to respond to ‘painful’ stimuli. In particular, Substance P makes one type of these proteins extremely sensitive to zinc, so that natural trace levels of zinc in circulation are enough to dampen their activity and suppress the neuronal responses. Professor Gamper – who is also a visiting professor at Hebei Medical University – believes this discovery could open the door to new drugs that don’t have the negative side effects currently associated with stronger painkillers. The study – which looked at the action of Substance P within nerve cells in the lab and in animal models – focused on acute pain, but Professor Gamper aims to look at its role within chronic pain as well. The research was funded by the Medical Research Council in the UK and by the National Basic Research Program and the National Natural Science Foundation of China. Plastic “continents ” are not static. Based on the oceanic circulation modelling work conducted in the Pacific, the IRD and CNRS researchers have recently shown that there are exit currents for these areas of the sea where these piles of waste build up. This means that they are not caught in a never-ending whirlpool in the middle of the ocean, as had been previously thought. Although inappropriate given the actual estimated concentrations, this term highlights the awareness of the impact of human activity on the oceans. Due to the winds on the surface of the oceans and the rotation of the Earth (via the Coriolis force), huge vortexes, called “oceanic gyres”, are formed in each of the five major basins: North and South Pacific, North and South Atlantic, and the Indian Ocean. These huge whirlpools slowly gather in their wake all the plastic objects and waste floating on the surface of the water, accumulating year after year. This pollution is now recognized as a global problem, representing a threat to marine biodiversity. In particular, this surface drift acts as a means of transport for the viruses and bacteria that the spread across the oceans. Nevertheless, these plastic “continents”, as they incorrectly christened, are not, in fact, static. The IRD and CNRS researchers have recently revealed the existence of “exit doors” leading away from these large surface current convergence zones. The scientists started by studying the oceanic circulation in the Pacific modeled with a much finer spatial resolution than that of the models generally used for this type of study (those typically used for climate research). They simulated the trajectories of several million particles, with currents defined on networks of 1/32° to 1/4° (meaning a range from a few kilometers to thirty or forty kilometers). The results obtained highlight currentsaeastwards instead. In addition to these currents there are physical processes such as the effects of the wind and waves, not taken into account in the models, which can also alter the trajectory and the transit time of the particles and waste. 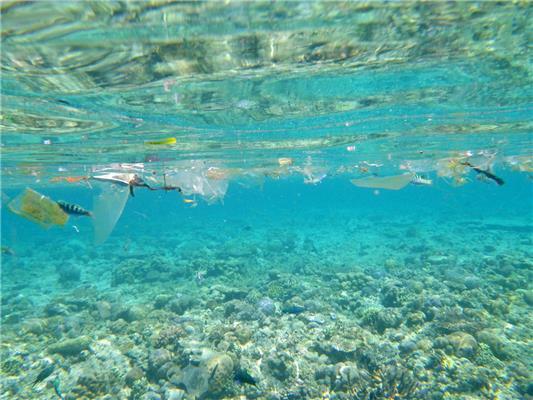 In the Pacific, the waste may not necessarily be trapped in the center of the oceanic gyre and may be removed in the direction of the American coasts. Furthermore, these results are backed up by the work of the IRD’s Chilean partners. They have observed an increase in the amount of waste collected on their coastlines. More detailed observations, modelling and analyses are required to gain a better understanding of the ocean surface currents that regulate the slow routing of plastic waste on the surface of the seas and, in the medium-term, implement strategies for collecting and recycling all of this waste. How can we ever know what ancient animals ate? For the first time, the changing diets of elephants in the last two million years in China have been reconstructed, using a technique based on analysis of the surface textures of their teeth. The work was carried out by a University of Bristol student, working with an international team of researchers. The research was published online in Quaternary International. Today, elephants live only in remote, tropical parts of Africa and southern Asia, but before the Ice Ages they were widespread. Interpretive illustration of proboscidean feeding ecology in the Late Pleistocene of southern China. Elephas (left) incoporates more graze in its diet; whereas Stegodon (right) is an obligate browser of fresh shoots and leaves. As his undergraduate research project, Zhang Hanwen, MSci Palaeontology and Evolution graduate and now PhD student at the University of Bristol, undertook cutting-edge analysis of fossilised elephant teeth from China. In a collaboration with the University of Leicester, and the Institute of Vertebrate Paleontology and Paleoanthropology in Beijing, where the fossilised teeth are curated, Hanwen sampled 27 teeth for tiny wear patterns called microwear. "We are talking huge, brick-sized molars here - the largest of any animal," said Hanwen, "but the signs of tooth wear are tiny, down to thousandths of a millimetre. However, these microscopic surface textures can tell us whether they were eating grass or leaves." Hanwen took peels of the fossilised teeth in China, using high-grade dental moulding materials, and captured the 3D surface textures under a digital microscope at the University of Leicester. The textures were quantified and analysed to identify what the elephants were eating in the days and weeks before they died. 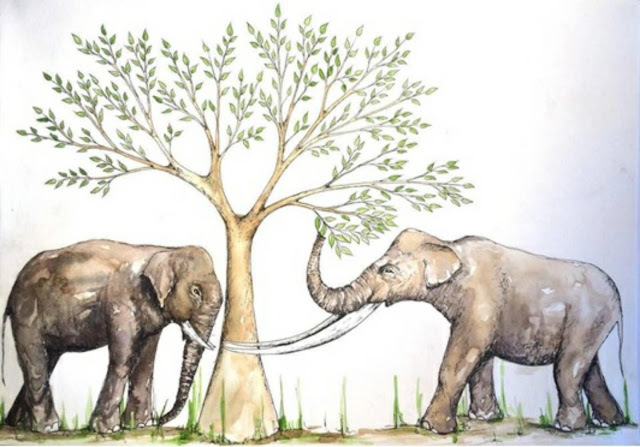 By comparing the results with information from modern ruminants (deer, antelopes and oxen) of known diet, the study concluded two extinct elephants from Southern China - Sinomastodon and Stegodon - were primarily browsing on leaves. The third, Elephas, which includes the modern Asian elephants, shows much more catholic feeding habit, incorporating both grazing and browsing. "It's wonderful that we can identify diets of any fossil mammal with confidence now," said Professor Christine Janis, from the University of Bristol, one of Hanwen's PhD supervisors and a leading expert on the evolution of herbivorous mammals. "This is based on the fact that the microwear textures produced by different kinds of plant material are comparable across unrelated animals." "This method for identifying diet relies on high-quality 3D surface data and analysis," said Professor Mark Purnell, of the University of Leicester, another co-supervisor of Hanwen's. "It removes the subjectivity of trying to quantify microwear textures by identifying and counting scratches and pits in 2D microscopic images." Sinomastodon and Stegodon coexisted in Southern China between 2.6 and one million years ago, but Sinomastodon then became extinct and left Stegodon to become the dominant elephant of Southern China for the remainder of the Pleistocene, the time of the great Ice Ages. 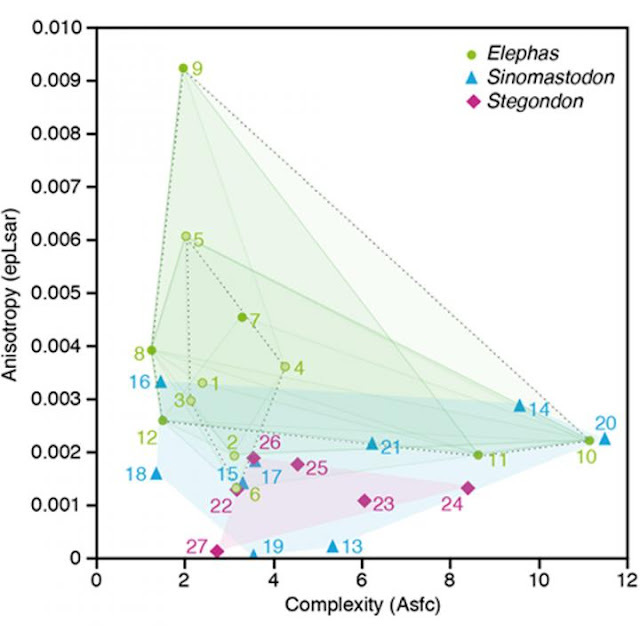 Anisotropy and complexity distribution of dental microwear in Sinomastodon, Stegodon and Elephas. Higher complexity is more typical of browsing; whereas higher anisotropy is more indicative of grazing. "The fossil pollen record, and recently-excavated mammal fossil assemblages from various karst cave sites near the Chinese-Vietnamese border, suggest a prolonged, fluctuating period of environmental deterioration around this time," Hanwen explained. He added: "Forests were on the decline, alongside many of the more archaic mammal species that inhabited them. The highly evolved molars of Stegodon, with multiple enamel ridges, might have allowed it to browse on its preferred foliage in a more efficient way, thus outcompeting Sinomastodon, which preferred the same diet, but had less sophisticated molars consisting of large, blunt, conical cusps." On the other hand, the new study also suggests that Stegodon and Elephas subsequently coexisted for long periods in Southern China by eating different things. Stegodon remained a specialist foliage feeder whereas Elephas was more of a generalist, consuming a wider variety of vegetation. Stegodon became extinct at around 11,000 years ago, at the end of the Pleistocene, coinciding with the worldwide disappearance of large mammal species at this time, including the iconic woolly mammoths, giant deers and sabretoothed cats. The Asian elephant survived in Southern China into historical times. 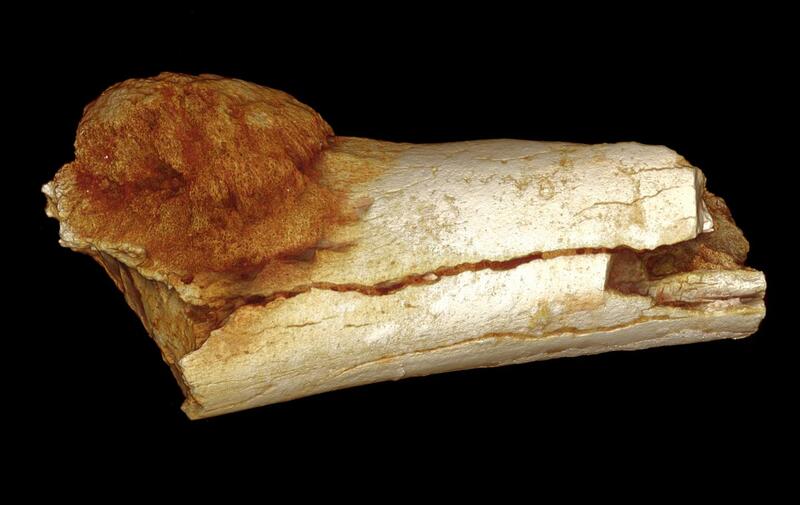 A paleolithic diet didn't prevent one ancient human from developing bone cancer. An international team of researchers led by scientists from the University of the Witwatersrand's Evolutionary Studies Institute and the South African Centre for Excellence in PalaeoSciences today announced in two papers, published in the South African Journal of Science, the discovery of the most ancient evidence for cancer and bony tumors yet described in the human fossil record. 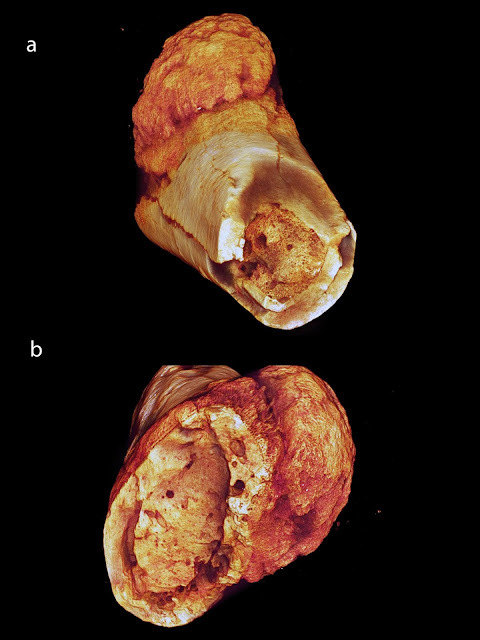 Volume rendered image of the external morphology of the foot bone shows the extent of expansion of the primary bone cancer beyond the surface of the bone. In an accompanying paper appearing in the same journal, a collaborating team of scientists identify the oldest tumor ever found in the human fossil record, a benign neoplasm found in the vertebrae of the well-known Australopithecus sediba child, Karabo from the site of Malapa, and dated to almost two million years in age. The oldest previously demonstrated possible hominin tumor was found in the rib of a Neanderthal and dated to around 120,000 years old. 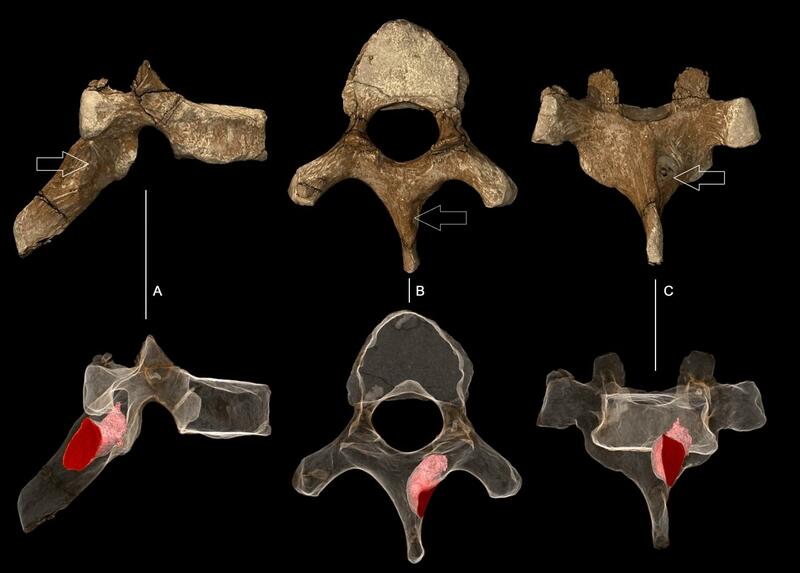 This image shows the sixth thoracic vertebra of juvenile Australopithecus sediba. Top row shows surface rendered image volume. Bottom row shows partially transparent image volume with the segmented boundaries of the lesion rendered solid pink. A: Right lateral view. B: Superior view. C: Posterior view. Lead author of the tumor paper and co-author of the cancer paper, Dr Patrick Randolph-Quinney of Wits University and the University of Central Lancashire in the UK, suggests "The presence of a benign tumor in Australopithecus sediba is fascinating not only because it is found in the back, an extremely rare place for such a disease to manifest in modern humans, but also because it is found in a child. This, in fact, is the first evidence of such a disease in a young individual in the whole of the fossil human record". Metatarsal (a) and (b) surface rendered models show medullary spongy bone infill and clear focalized cortical destruction near the periosteal margin; also evident on external cortical margin directly abutting malignant neoplasm is the characteristic hair on end bone reaction in (b). Prof. Lee Berger, an author on both papers and leader of the Malapa project where the fossil vertebra was found adds "not only has there been an assumption that these sorts of cancers and tumors are diseases of modernity, which these fossils clearly demonstrate they are not, but that we as modern humans exhibit them as a consequence of living longer, yet this rare tumor is found in a young child. The history of these types of tumors and cancers is clearly more complex than previously thought". In an imitation "do-as-I-do" game, eleven-year-old Rocky, who was eight at the time of the research, was able to copy the pitch and tone of sounds made by researchers to make vowel-like calls. The discovery, led by Dr Adriano Lameira of Durham University, UK, shows that orangutans could have the ability to control their voices. It might answer the argument about whether or not spoken language stemmed from early human ancestors. Previously it was thought that great apes - our closest relatives - could not learn to produce new sounds and because speech is a learned behavior it could not have originated from them. The findings are published today (Wednesday, July 27) in the journal Scientific Reports. Rocky was studied at Indianapolis Zoo, Indiana, USA, where he is currently housed, between April and May 2012, and all steps were taken to ensure his routine and environment were not disrupted. During the study, a researcher made random sounds with variations in the tone or pitch of her voice which Rocky then mimicked. The research team compared these sounds against the largest available database of orangutan calls collected from over 12,000 hours of observations of more than 120 orangutans from 15 wild and captive populations. They were able to conclude that the sounds made by Rocky were different compared to the sounds on the database, showing that he was able to learn new sounds and control the action of his voice in a "conversational" context. Dr Lameira, who was not a member of Durham University staff at the time of the research but joined the Department of Anthropology in 2015, said: "It's not clear how spoken language evolved from the communication systems of the ancestral great apes. "Instead of learning new sounds, it has been presumed that sounds made by great apes are driven by arousal over which they have no control, but our research proves that orangutans have the potential capacity to control the action of their voices. "This indicates that the voice control shown by humans could derive from an evolutionary ancestor with similar voice control capacities as those found in orangutans and in all great apes more generally. "This opens up the potential for us to learn more about the vocal capacities of early hominids that lived before the split between the orangutan and human lineages to see how the vocal system evolved towards full-blown speech in humans." The research also involved the Pongo Foundation (Netherlands); Max Planck Institute for Evolutionary Anthropology (Germany); Liverpool John Moores University (UK); University of Amsterdam (Netherlands); Indianapolis Zoo (USA); George Mason University (USA); Indiana University (USA). It builds on a previous study led by Dr Lameira when he was based at the University of Amsterdam. 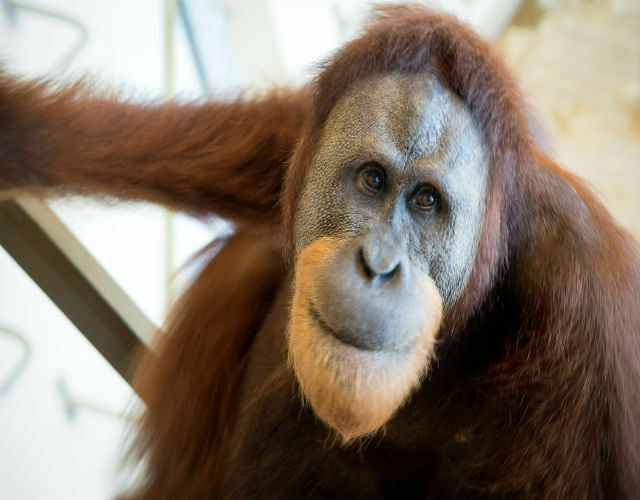 In that study, published in January 2015, it was reported that a female orangutan called Tilda at Cologne Zoo, in Germany, was able to make sounds comparable to human consonant and vowel-like calls at the same rhythm and pace as human speech. Dr Lameira's current work is supported by European Union COFUND/Durham Junior Research Fellowship funding. * Durham University is a signatory to the Concordat on Openness in Animal Research in the UK. Conducting the first large-scale, genome-wide analyses of ancient human remains from the Near East, an international team led by Harvard Medical School has illuminated the genetic identities and population dynamics of the world's first farmers. The study reveals three genetically distinct farming populations living in the Near East at the dawn of agriculture 12,000 to 8,000 years ago: two newly described groups in Iran and the Levant and a previously reported group in Anatolia, in what is now Turkey. Genetic analyses reveal a collection of highly distinct groups in the Near East and Europe at the dawn of agriculture. These groups mixed and migrated to form the relatively homogeneous populations seen in the region today. The findings, published in Nature on July 25, also suggest that agriculture spread in the Near East at least in part because existing groups invented or adopted farming technologies, rather than because one population replaced another. "Some of the earliest farming was practiced in the Levant, including Israel and Jordan, and in the Zagros mountains of Iran--two edges of the Fertile Crescent," said Ron Pinhasi, associate professor of archaeology at University College Dublin and co-senior author of the study. "We wanted to find out whether these early farmers were genetically similar to one another or to the hunter-gatherers who lived there before so we could learn more about how the world's first agricultural transition occurred." The team's analyses alter what is known about the genetic heritage of present-day people in western Eurasia. They now appear to have descended from four major groups: hunter-gatherers in what is now western Europe, hunter-gatherers in eastern Europe and the Russian steppe, the Iran farming group and the Levant farming group. "We found that the relatively homogeneous population seen across western Eurasia today, including Europe and the Near East, used to be a highly substructured collection of people who were as different from one another as present-day Europeans are from East Asians," said David Reich, professor of genetics at Harvard Medical School and co-senior author of the study. "Near East populations mixed with one another over time and migrated into surrounding regions to mix with the people living there until those initially quite diverse groups became genetically very similar," added Iosif Lazaridis, HMS research fellow in genetics and first author of the study. Even as advances in ancient-DNA technology have made it possible to probe population mixing and large-scale migrations that occurred thousands of years ago, researchers have had trouble studying the genetic history of the Near East because the region's warm climate has degraded much of the DNA in unearthed bones. The team overcame the problem of poor-quality DNA in part by extracting genetic material from ear bones that can yield up to 100 times more DNA than other bones in the body. The team also used a technique called in-solution hybridization to enrich for human DNA and filter out contaminant DNA from microbes. The combined techniques allowed the researchers to gather high quality genomic information from 44 ancient Near Easterners who lived between 14,000 and 3,400 years ago: hunter-gatherers from before the invention of farming, the first farmers themselves and their successors. By comparing the genomes to one another as well as to those of nearly 240 previously studied ancient people from nearby regions and about 2,600 present-day people, the researchers learned that the first farming cultures in the Levant, Iran and Anatolia were all genetically distinct. Farmers in the Levant and Iran were genetically similar, however, to earlier hunter-gatherers who had lived in the same areas. "Maybe one group domesticated goats and another began growing wheat, and the practices were shared in some way," said Lazaridis. "These different populations all invented or adopted some facets of the farming revolution, and they all flourished." The findings tell a different story from what researchers believe happened later in Europe, when the first farmers moved in from Anatolia and largely replaced the hunter-gatherer populations who'd been living there. "All this extraordinary diversity collapsed," said Reich. "By the Bronze Age, populations had ancestry from many sources and broadly resembled present-day ones." "The Near East was the missing link to understanding many human migrations," said Pinhasi. Finally, the study provides a few more clues about a hypothetical, even more ancient, population called the Basal Eurasians, an early diverging branch of the family tree of humans living outside Africa, whose existence Lazaridis has inferred from DNA analyses but whose physical remains have not yet been found. "Every single group from the ancient Near East appears to have Basal Eurasian ancestry--up to around fifty percent in the earliest groups," said Lazaridis. To the researchers' surprise, statistical analyses suggested that the Basal Eurasians may have had no Neanderthal DNA. Other non-African groups have at least 2 percent Neanderthal DNA. "Admixture with Basal Eurasians may have diluted the Neanderthal ancestry in West Eurasians who have ancient Near Eastern farmer ancestry," said Reich. "Basal Eurasians may have lived in parts of the Near East that did not come into contact with the Neanderthals." Going forward, said Pinhasi, "We're eager to study remains from the world's first civilizations, who succeeded the samples analyzed in the study. The people everyone reads about in history books are now within the reach of our genetic technology." This artist's impression shows the strange object AR Scorpii. In this unique double star a rapidly spinning white dwarf star (right) powers electrons up to almost the speed of light. These high energy particles release blasts of radiation that lash the companion red dwarf star (left) and cause the entire system to pulse dramatically every 1.97 minutes with radiation ranging from the ultraviolet to radio. In a unique twist, this binary star system is exhibiting some brutal behaviour. Highly magnetic and spinning rapidly, AR Sco's white dwarf accelerates electrons up to almost the speed of light. As these high energy particles whip through space, they release radiation in a lighthouse-like beam which lashes across the face of the cool red dwarf star, causing the entire system to brighten and fade dramatically every 1.97 minutes. These powerful pulses include radiation at radio frequencies, which has never been detected before from a white dwarf system. Lead researcher Tom Marsh of the University of Warwick's Astrophysics Group commented: "AR Scorpii was discovered over 40 years ago, but its true nature was not suspected until we started observing it in June 2015. We realised we were seeing something extraordinary the more we progressed with our observations." The observed properties of AR Sco are unique. And they are also mysterious. The radiation across a broad range of frequencies is indicative of emission from electrons accelerated in magnetic fields, which can be explained by AR Sco's spinning white dwarf. The source of the electrons themselves, however, is a major mystery -- it is not clear whether it is associated with the white dwarf, or its cooler companion. AR Scorpii was first observed in the early 1970s and regular fluctuations in brightness every 3.6 hours led it to be incorrectly classified as a lone variable star . The true source of AR Scorpii's varying luminosity was revealed thanks to the combined efforts of amateur and professional astronomers. Similar pulsing behaviour has been observed before, but from neutron stars -- some of the densest celestial objects known in the Universe -- rather than white dwarfs. The observations underlying this research were carried out on: ESO's Very Large Telescope(VLT) located at Cerro Paranal, Chile; the William Herschel and Isaac Newton Telescopes of theIsaac Newton Group of telescopes sited on the Spanish island of La Palma in the Canaries; theAustralia Telescope Compact Array at the Paul Wild Observatory, Narrabri, Australia; theNASA/ESA Hubble Space Telescope ; and NASA's Swift satellite. White dwarfs form late in the life cycles of stars with masses up to about eight times that of our Sun. After hydrogen fusion in a star's core is exhausted, the internal changes are reflected in a dramatic expansion into a red giant, followed by a contraction accompanied by the star's outer layers being blown off in great clouds of dust and gas. Left behind is a white dwarf, Earth-sized but 200 000 times more dense. A single spoonful of the matter making up a white dwarf would weigh about as much as an elephant here on Earth. The dragons from ‘Game of Thrones’ have come to life in insect form. 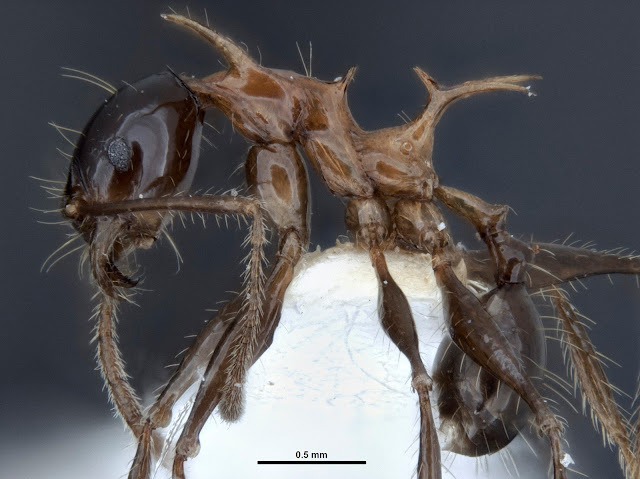 New ant species that appear dragon-like due to their large and distinctive spines were recently found in the tropical rainforests of Papua New Guinea. Pheidole viserion, a newly discovered ant species from Papua New Guinea, imaged with traditional photographic techniques. Although they lack fire-breathing capabilities, the unique, spiny characteristics of the ants reminded the scientists who discovered them of the mythical dragons from the fantasy series and inspired them to name the ants after the 'Game of Thrones' dragons. The researchers, Dr. Georg Fischer, Dr. Eli Sarnat, and Prof. Evan Economo from the Okinawa Institute of Science and Technology Graduate University (OIST), used cutting-edge 3D-imaging technology to help identify and document several new ant species in two different papers published in PLOS ONE. The process of identifying, documenting, and naming new species, "taxonomy" is one of the oldest and most basic tasks in biology. Traditionally, new species are described with photographs, drawings, and verbal descriptions. In this study, the authors used new 3D imaging technology called X-Ray microtomography, which is similar to CT scans used in hospitals, only at a much higher resolution suitable for smaller objects, such as an ant. "This is one of the first studies in ant taxonomy to use micro-CT," said Economo, head of OIST's Biodiversity and Biocomplexity Unit. "While this method is gaining popularity in different scientific fields, it is rare to use it in this way." Once an ant is scanned using this method, it becomes a virtual specimen that "lives" in 3D; it can then be dissected, archived, and shared with other scientists around the world. "If you are working in the bush in Africa and find an ant that you want to identify, it is really difficult to fly all the way to a museum in Europe or the U.S. to see collections of already known species," Fischer, co-author and postdoctoral scholar in OIST's Biodiversity and Biocomplexity unit said. "This way you can download the virtual ant, make measurements, and compare it to the specimen you are trying to identify." 3-D scans of Pheidole drogon minor (left) and major worker (right), a newly discovered species named after the dragons in 'Game of Thrones'. This is almost the same as having the physical specimen in front of you and "in some ways it is better than the real thing," Economo added. "Because you can virtually dissect the specimen and examine internal structure on your computer." The researchers used 3D imaging together with more traditional techniques, to describe two groups of ant species, one from Papua New Guinea and the other from Fiji. The team then created 3D galleries of each species, both new and previously known, which should be especially useful for people looking to identify and differentiate ant specimens. The researchers also took advantage of these new 3D imaging capabilities to look inside the spines of the major worker ants for clues to their function. While the most obvious function of the spines is for defence against predators, the researchers additionally found that the spines were filled with muscle, which may make the ants stronger and more robust relative to non-spiny ants. The muscle fibers (red) can be seen inside the spines of the virtually dissected 3D ant. The integration of X-ray micro-CT and 3D imaging is a modern and tech-savvy take on the ancient art of taxonomy; and the continuous advance of modern technology provides new and exciting opportunities to improve even the oldest of disciplines. "Taxonomy is fundamental to all other biological sciences, because it allows us to organize the information we discover about living things, but too often it is seen as boring or old-school," Economo said. "These new technologies can revolutionize the way we discover, document, and share information about new species, which is disruptive in an exciting way." An unusual celestial object called CX330 was first detected as a source of X-ray light in 2009. It has been launching “jets” of material into the gas and dust around it. Here on Earth, sunlight heats the atmosphere at altitudes well above the surface—for example, at 250 miles above our planet where the International Space Station orbits. Scientists have been stumped as to why temperatures in Jupiter’s upper atmosphere are comparable to those found at Earth, yet Jupiter is more than five times the distance from the sun. They wanted to know: if the sun isn’t the heat source, then what is? Researchers from Boston University’s Center for Space Physics set out to solve the mystery by mapping temperatures well above Jupiter’s cloud tops using observations from Earth. They analyzed data from the SpeX spectrometer at NASA’s Infrared Telescope Facility (IRTF) on Mauna Kea, Hawaii, a 3-meter infrared telescope operated for NASA by the University of Hawaii. By observing non-visible infrared light hundreds of miles above the gas giant, scientists found temperatures to be much higher in certain latitudes and longitudes in Jupiter’s southern hemisphere, where the spot is located. “We could see almost immediately that our maximum temperatures at high altitudes were above the Great Red Spot far below—a weird coincidence or a major clue?” said Boston University’s James O’Donoghue, lead author of the study. The study, in the July 27 issue of the journal Nature, concludes that the storm in the Great Red Spot produces two kinds of turbulent energy waves that collide and heat the upper atmosphere. Gravity waves are much like how a guitar string moves when plucked, while acoustic waves are compressions of the air (sound waves). Heating in the upper atmosphere 500 miles (800 kilometers) above the Great Red Spot is thought to be caused by a combination of these two wave types “crashing,” like ocean waves on a beach. This effect has been observed over the Andes Mountains here on Earth and may also be happening elsewhere in the outer solar system, though it has not been directly observed. Scientists believe this phenomenon also occurs on giant exoplanets orbiting other stars. The Great Red Spot (GRS) has delighted and mystified since its discovery in the 17th Century. With its swirl of reddish hues, it’s 2-3 times as wide as Earth and is seen by many as a “perpetual hurricane,” with winds peaking at about 400 miles an hour. NASA's Juno spacecraft, which recently arrived at Jupiter, will have several opportunities during its 20-month mission to observe the Great Red Spot and the turbulent region surrounding it. Juno will peer hundreds of miles downward into the atmosphere with its microwave radiometer, which passively senses heat coming from within the planet. This capability will enable Juno to reveal the deep structure of the Great Red Spot, along with other prominent Jovian features, such as the colorful cloud bands. Cygnus A is an elliptical galaxy at around 600 million light years from the Earth, which has a supermassive black hole at its center. It is one of the brightest sources of radio waves in the sky and featured in Contact, the famous science fiction novel by Carl Sagan which was made into a film. It has an active galactic nucleus which means that the black hole is "swallowing" material from its surroundings. When this occurs strong electromagnetic radiation is produced, as well as large jets of particles which are emitted from the galactic nucleus at a speed close to that of light, travelling beyond the edge of the galaxy and reaching three hundred thousand light years into the intergalactic medium. This is a view of the jets of the elliptical galaxy in Cygnus A. 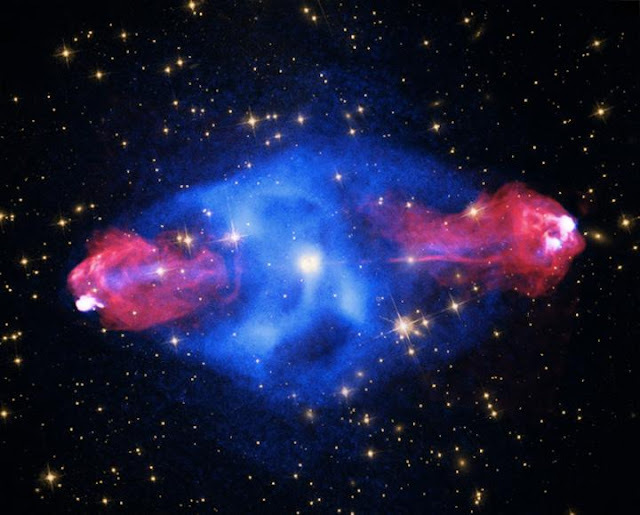 Credit: X-ray image: NASA/CXC/SAO; visible light image: NASA/STScI; radio waves image: NSF/NRAO/AUI/VLA. This is the first time that polarimetric observations in the middle infrared region of the spectrum (1) have been made of the nucleus of an active galaxy. "The combination of the Gran Telescopio CANARIAS (GTC) and CanariCam offers unique capabilities for the observation of active galaxies using polarimetric techniques in the middle infrared" explains Enrique López Rodríguez, a researcher at the University of Texas in Austin (EE UU) and the first author of this study, published in the Astrophysical Journal. "There is no other comparable instrument of this kind, he stresses, and no such instruments are expected until the next decade, because the instruments which are being developed now cannot make polarimetric measurements". Polarimetry is the technique which studies the intensity and the orientation of electromagnetic waves. "If the observed radiation is polarized in a given sense and with a given dependence on wavelength we can obtain information about the physical mechanisms which produce the polarization. This technique helps us squeeze out the last drop of information from each photon picked up by the GTC" says López Rodríguez". "Polarimetry" he adds lets us eliminate from the observations all the light which is not affected by the magnetic field in the active nucleus, so that we can filter out everything which comes from other sources, such as the galaxy itself, or background stars. This gives us a much higher contrast when we observe the jets and the dust in the galaxy, while studying the influence of the magnetic field on both of them". On the basis of these observations the astronomers have been able to detect that the plasma ejected from the active nucleus is spiraling around the magnetic field of the jet, which generates a type of radiation known as "synchrotron radiation", produced by the rapid movement of electrons around magnetic fields. Although this phenomenon had been observed previously at other wavelengths, this is the first time it has been detected in the middle infrared, which has enabled us to confirm that the plasma in the jet of Cygnus A is highly confined by the effect of the magnetic field. 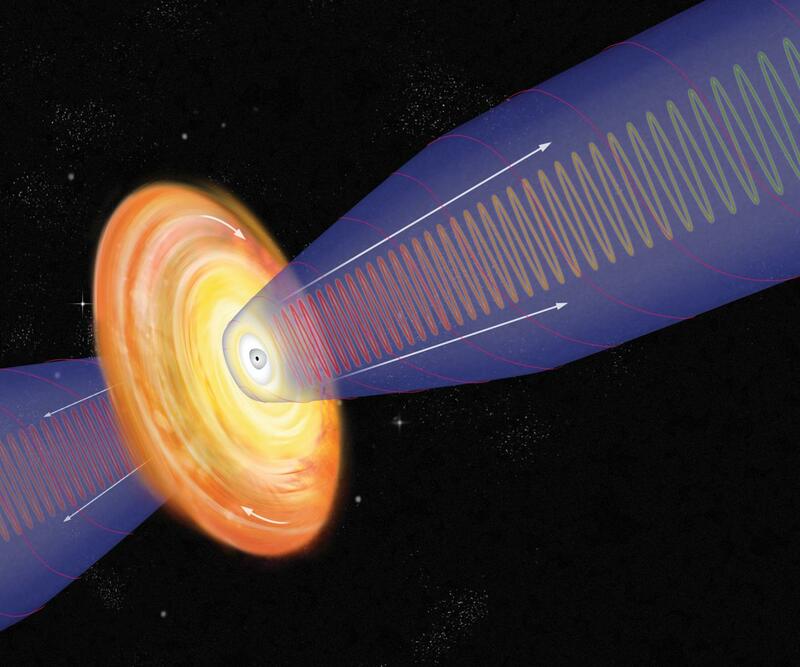 These observations allow us to obtain information about the configuration of the magnetic field in the neighbourhood of the black hole (2), valuable information which cannot be directly observed. Astronomers classify Cygnus A as a radiogalaxy because it is one of the most powerful radio sources in the sky. It was observed for the first time in 1939 and it is named because it is the strongest radio source in the constellation of the Swan (latin name Cygnus). Nevertheless this galaxy emits radiation over the full range of the electromagnetic spectrum which makes it an ideal astronomical laboratory, and one of the favourite objects of astronomers, who have been making observations with diverse instruments and at different wavelengths, interpreting them to compose the pieces of a cosmic jigsaw which will let us understand better what is happening in that region of the universe. Cygnus A has a very complex structure which includes a compact nucleus and opposed jets of matter emitted from the centre of the galaxy towards the edges, all shrouded in a mantle of dust with an irregular structure which is impenetrable to visible light. "It is a paradigm galaxy for studying the formation and evolution of jets, because the dust completely obscures the centre of the galaxy, so that we cannot detect well the light emitted by the jets" explains López Rodríguez. This is why the research team has used CanariCam, and instrument designed to detect infrared radiation, which is not blocked by interstellar dust. Novel observations by an international group of researchers with the CanariCam instrument on the Gran Telescopio CANARIAS provide new information about magnetic fields around the active nucleus of the galaxy Cygnus A. This is the first time that polarimetric observations in the middle infrared region of the spectrum have been made of the nucleus of an active galaxy. The Gran Telescopio CANARIAS is uniquely equipped to make these observations. Thanks to its large primary mirror, which favours high spatial resolution, and the CanariCam instrument, which can observe in the middle infrared wavelength range, we can study the infrared radiation emitted by the galaxy. This emission comes from matter which is not hot enough to emit visible light, but are warm enough (around 220K, which is -53ºC) to emit infrared radiation. In addition the polarimetric capability of CanariCam gives an additional dimension of information with which astronomers can analyze to interpret different physical mechanisms. Until now very little has been known about the polarization of the infrared radiation emitted by the supermassive black holes which are at the centres of the majority of galaxies. Astronomers hope that these, and other similar observations can provide new data which will help them to understand the mechanisms which cause the activity of these cosmic monsters, and their influence on the galaxies which they inhabit. With the aim of explaining the dominant mechanism which polarizes the radiation from Cygnus A at infrared wavelengths this study presents polarimetric observations at high angular resolution (0.4 arcseconds) in the filters at 8.7mm and 11.6 mm, using the CanariCam instrument on the Gran Telescopio CANARIAS (GTC) of 10.4 metres diameter at the Roque de los Muchachos Observatory of the Instituto de Astrofísica de Canarias on the island of La Palma (Spain). For Cygnus A, the 65% of polarization measured in the middle infrared is close to the theoretical máximum of 70% which indicates that there is a highly ordered magnetic field around the nucleus of Cygnus A. Did a Superluminous Supernova Exploded Twice? There are several different types of supernovae. 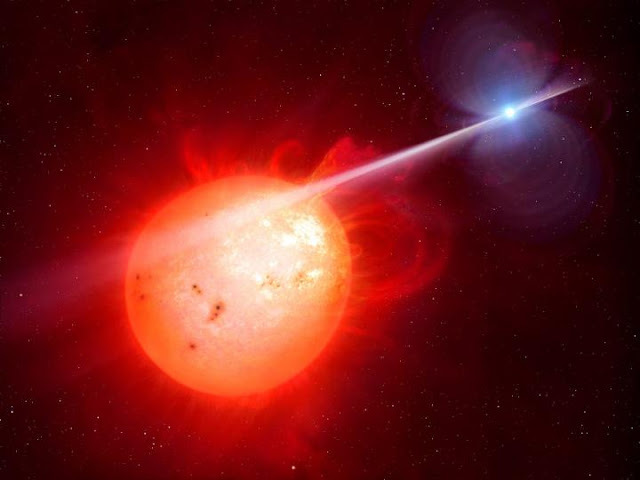 The astronomers classify them by their observable characteristics, which in turn give clues about how they have originated, among the most well known are those of Type Ia, which occur when a white dwarf (which is the final state of a star slightly more massive than the Sun) absorbs mass from another nearby star, or merges with another white dwarf. When that happens its mass grows until it becomes unstable, and a thermonuclear explosion is triggered. As these events produce a characteristic luminosity, they can be used by astronomers as "standard candles" to measure large distances in the universe, in a similar way to that used by sailors to infer the distance of a known lighthouse at night by estimating its brightness. The Chandrasekhar limit is the maximum mass which a white dwarf can attain without collapsing into a neutron star (or black hole) under its own gravity. This limit is at 1.4 times the mass of the Sum. The Gran Telescopio CANARIAS (GTC), located about 2,400 meters altitude in the Observatorio del Roque de los Muchachos, en Garafía (La Palma). In recent years a new type of supernova has been discovered, about which still very little is known, and which are brighter and longer lasting, so that they have been called superluminous supernovae (SLSN). 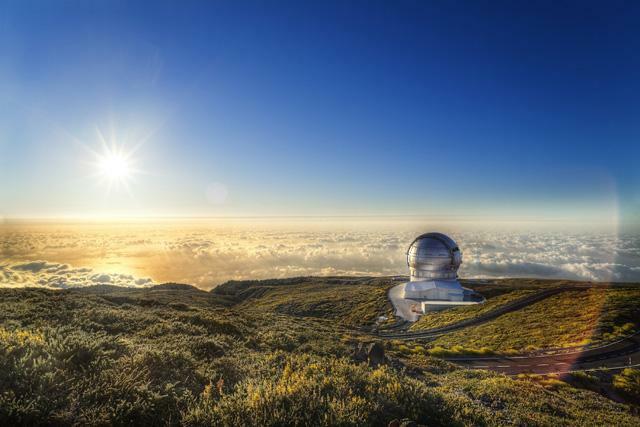 Although only about a dozen of them are known, an international group of researchers has been able to use the Gran Telescopio CANARIAS (GTC) to observe a superluminous supernova almost from the moment it occurred. 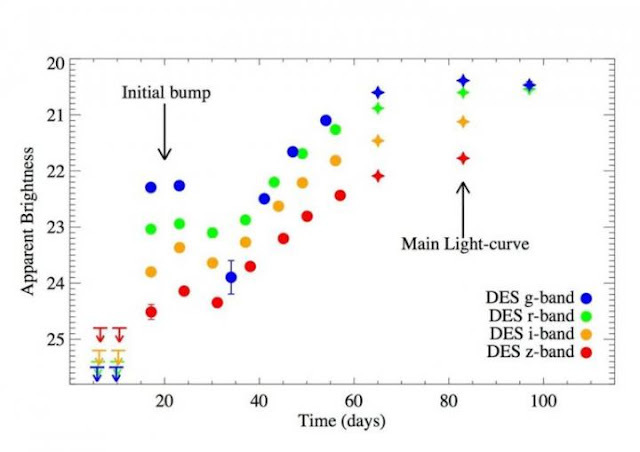 The research has revealed surprising behaviour, because this supernova showed an initial increase in brightness which later declined for a few days, and later increased again much more strongly. The scientists have used the data observed at the GTC and has combined them with other observations in order to try to explain the origin of the phenomenon. "Superluminous supernovas are up to a hundred times more energetic than Type 1a's because they can remain bright for up to six months before fading rather than just a few weeks" explained Mathew Smith, a postdoctoral researcher at the University of Southampton (UK) and the person directing this study, whose results have been published in the specialized journal The Astrophysical Journal Letters. "What we have managed to observe, which is completely new" adds Smith, "is that before the major explosion there is a shorter, less luminous outburst, which we can pick out because it is followed by a dip in the light curve, and which lasts just a few days". It is the first time that something like this has been observed in a supernova. "From our data we have tried to determine if this is a characteristic unique to this object, or whether it is a common feature of all superluminous supernovas, but has not been observed before, which is perfectly possible given their unpredictable nature" comments the scientist. This new, intriguing object, given the cryptic name of "DES14X3taz" by the astronomers, was discovered on December 21st 2014 by the Dark Energy Survey (2) an international project which surveys the night sky making precision measurements of over 300 million galaxies which are situated thousands of millions of light years from Earth, and incidentally detecting thousands of supernovae and other transient phenomena. The objective of this survey is to help explain the expansion of the universe, and to find clues to the nature of the elusive dark energy (3). To do this astronomers are using an extremely sensitive digital camera, of 570 Megapixels, on the four metre Victor M. Blanco telescope at the Inter-American Observatory at Cerro Tololo (Chile). The Dark Energy Survey is an international collaboration of over 400 scientists from 25 institutions in 7 countries: The US, Spain, the UK, Brazil, Germany, Switzerland, and Australia. Dark energy is a form of energy present throughout space, which produces a pressure tending to accelerate the expansion of the universe. This acts as a type of gravitational repulsion. Once DES14X3taz had been identified as a possible superluminous supernova an immediate observation was requested on the GTC, which turned its powerful eye towards it during the two nights of observation: January 26th and February 6th 2915. This could be done because the GTC devotes some of its observing time to "targets of opportunity" so that other, programmed observations which can be made at another time are postponed to give priority to transient phenomena, which may offer unrepeatable opportunities. "The GTC, with its huge 10.4m mirror, and its OSIRIS instrument, is the ideal tool to observer this SNSL, which is at a vast distance and because we are looking for information in the visible and the near infrared" commented Smith, who is a participant in the Dark Energy Survey. Thanks to the observations made with the GTC and other telescopes, Smith and his collaborators could reconstruct the evolution of the brightness of DES14X3taz from almost the moment of its detection. They have also determined its absolute brightness with great precision, as well as its distance, some 6,400 million light years. A light year, in spite of its name, is really a distance, defined by the distance light travels in a year. The light emitted by the explosion of DES14X3taz has taken 6,400 million years to reach the Earth. The age of the universe is almost 14 thousand million years. After comparing their observations with several physical models the astronomers concluded in their article that the most plausible explanation is that the mechanism which causes this supernova is the birth of a "magnetar", a neutron star which rotates very rapidly on its axis. In the data the initial peak of the brightness graph is followed by rapid cooling of the object, after which there is a new, and quicker rise in brightness. This is consistent with the emission of a huge bubble of material into the surrounding space, with cools rapidly as it grows in size. "We think that a very massive star, some 200 times the mass of the Sun, collapses to form a magnetar. In the process the first explosion occurs, which expels into space a quantity of matter equivalent to the mass of our Sun, and this gives rise to the first peak of the graph. The second peak occurs when the star collapses to form the magnetar, which is a very dense object rotating rapidly on its axis, and which heats up the matter expelled from the first explosion. This heating is what generates the second peak in the luminosity" explains Smith. This graph shows the evolution of the apparent brigntness of the new supernova it is shown according to data collected by the Dark Energy Survey. It can be seen how an initial increase in brightness occurs which is then reduced for several days. Subsequently, the brightness increases again during the main sequence of the supernova. Research of this type allows us to get to know the physical phenomena which cause the superluminous supernovas, and this understanding may allow us to "standardize" it (as has been done for the type Ia's) so we could use it as a reference source for distance measurement on large scales in the universe. Its high luminosity may make these objects very useful for making distances on larger scales, and with greater accuracy than we can do at the moment. However before we get to that point we need a much deeper understanding of their origin and their nature. Another mystery about this new type of supernovae is that, up to now, all the cases detected have been in small galaxies with low metallicity (low content in heavy elements) and we have no explanation of this. "It is a part of the mystery of these objects "says Smith, in humorous vein, and adds that among future priorities we need to detect more superluminous supernovae, and oberve them since the moment they explode, and in real time with a telescope of the size of the GTC. A new study by Western University demonstrates that smaller carnivores, like European badgers, that may be prey to large carnivores, actually perceive humans as far more frightening. Globally, humans now kill smaller carnivores at much higher rates than large carnivores do, and these results indicate that smaller carnivores have learned to fear the human 'super predator' far more than they fear their traditional enemies. These findings by Liana Zanette and Michael Clinchy from Western's Faculty of Science, in collaboration with celebrated British biologist David Macdonald from University of Oxford's Wildlife Conservation Research Unit (WildCRU) and others, were published this week inBehavioral Ecology. Zanette, a professor in Western's Department of Biology, and her colleagues experimentally demonstrated that smaller carnivores, like badgers, foxes and raccoons, that may appear to be habituated to humans because they live among us, are actually experiencing elevated levels of fear - living in fear of the human 'super predator' in human-dominated landscapes. "Our previous research has shown that the fear large carnivores inspire can itself shape ecosystems. These new results indicate that the fear of humans, being greater, likely has even greater impacts on the environment, meaning humans may be distorting ecosystem processes even more than previously imagined," explains Zanette, a renowned wildlife ecologist. "These results have important implications for conservation, wildlife management and public policy." By frightening their prey, large carnivores help maintain healthy ecosystems by preventing smaller carnivores from eating everything in sight, and the loss of this 'landscape of fear' adds to conservation concerns regarding the worldwide loss of large carnivores. Fear of humans has been proposed to act as a substitute, but these new results demonstrate that the fear of humans is qualitatively different and cannot be expected to fulfill the same ecosystem function. It takes a little imagination to wish some favorite fictional universes into existence. But, for legions of "Star Trek" fans, they don’t have to wish: one star system really exists in our Milky Way galaxy. In Star Trek lore, Vulcan is the home of logic, learning and the deeply beloved first officer Mr. Spock. 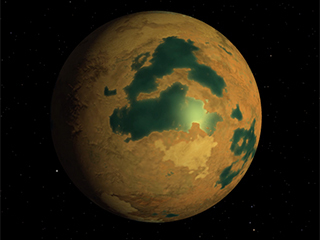 While Vulcan is fictional, the star system it belongs to–40 Eridani–is very real. It’s located only 16.5 light-years away from Earth and its primary star can be spotted with the naked eye. So how much is science fiction and how much is science fact? “Could there be an Earth-like planet in this system? We have no way of knowing that now,” said Karl Stapelfeldt, chief scientist of NASA’s Exoplanet Exploration Program. So while Vulcan (as far as we know) doesn’t exist, a fascinating triple sunset would occur on any rocky planet in the system, because 40 Eridani has three stars that circle each other. The most massive is 40 Eridani A, a dwarf star that is the mythical Vulcan’s sun. The other two are a pair, orbiting each other at a distance from 40 Eridani A. This binary pair contains a red dwarf (40 Eridani C)­ and a white dwarf star (40 Eridani B). From the surface of Vulcan, “they would gleam brilliantly in the Vulcan sky,” according to Rodenberry in his 1991 letter to Sky & Telescope magazine. If you believe in science fiction, Mr. Spock’s dreamt-up world lives in the habitable zone of the largest star, 40 Eridani A. The habitable zone, shown as the area in blue-green, is the distance from a star where liquid water is said to exist. Too far away from its sun and Vulcan would freeze like Pluto; too close and it would sizzle like Mercury. Vulcan is perched on the inner edge, lending the world its imagined desert-like quality (at least, in a timeline where the planet remains undestroyed). But if there were a planet like Vulcan in the 40 Eridani system, would we be able to see it? Not yet. “We don’t yet have a way to detect it, but NASA is working on the technology to make it possible,” Stapelfeldt said. A new understanding of our galaxy's structure began in an unlikely way: on Twitter. A research effort sparked by tweets led scientists to confirm that the Milky Way's central bulge of stars forms an "X" shape. The newly published study uses data from NASA's Wide-field Infrared Survey Explorer (WISE) mission. The unconventional collaboration started in May 2015 when Dustin Lang, an astronomer at the Dunlap Institute of the University of Toronto, posted galaxy maps to Twitter, using data from WISE's two infrared surveys of the entire sky in 2010. Infrared light allows astronomers to see the structures of galaxies in spite of dust, which blocks crucial details in visible light. Lang was using the WISE data in a project to map the web of galaxies far outside our Milky Way, which he made available through an interactive website. X Marks the Spot for Milky Way Formation Researchers used data to highlight the X-shaped structure in the bulge of the Milky Way. To reveal the X shape in the Milky Way's central bulge. Researchers used data from NASA's Wide-field Infrared Survey Explorer (WISE) mission to highlight the X-shaped structure in the bulge of the Milky Way. But it was the Milky Way's appearance in the tweets that got the attention of other astronomers. Some chimed in about the appearance of the bulge, a football-shaped central structure that is three-dimensional compared to the galaxy's flat disk. Within the bulge, the WISE data seemed to show a surprising X structure, which had never been as clearly demonstrated before in the Milky Way. Melissa Ness, a postdoctoral researcher at the Max Planck Institute for Astronomy in Heidelberg, Germany, recognized the significance of the X shape, and contacted Lang. The two met a few weeks later at a conference in Michigan, and decided to collaborate on analyzing the bulge using Lang's WISE maps. Their work resulted in a new study published in the Astronomical Journal confirming an X-shaped distribution of stars in the bulge. "The bulge is a key signature of formation of the Milky Way," said Ness, the study's lead author. "If we understand the bulge we will understand the key processes that have formed and shaped our galaxy." The Milky Way is an example of a disk galaxy -- a collection of stars and gas in a rotating disk. In these kinds of galaxies, when the thin disk of gas and stars is sufficiently massive, a "stellar bar" may form, consisting of stars moving in a box-shaped orbit around the center. Our own Milky Way has a bar, as do nearly two-thirds of all nearby disk galaxies. To reveal the X shape in the Milky Way's central bulge, researchers took WISE observations and subtracted a model of how stars would be distributed in a symmetrical bulge. Over time, the bar may become unstable and buckle in the center. The resulting "bulge" would contain stars that move around the galactic center, perpendicular to the plane of the galaxy, and in and out radially. When viewed from the side, the stars would appear distributed in a box-like or peanut-like shape as they orbit. Within that structure, according to the new study, there is a giant X-shaped structure of stars crossing at the center of the galaxy. "We see the boxy shape, and the X within it, clearly in the WISE image, which demonstrates that internal formation processes have driven the bulge formation," Ness said. "This also reinforces the idea that our galaxy has led a fairly quiet life, without major merging events since the bulge was formed, as this shape would have been disrupted if we had any major interactions with other galaxies." The Milky Way's X-shaped bulge had been reported in previous studies. Images from the NASA Cosmic Background Explorer (COBE) satellite's Diffuse Infrared Background Experimentsuggested a boxy structure for the bulge. In 2013, scientists at the Max Planck Institute for Extraterrestrial Physics published 3-D maps of the Milky Way that also included an X-shaped bulge, but these studies did not show an actual image of the X shape. Ness and Lang's study uses infrared data to show the clearest indication yet of the X shape. Additional research is ongoing to analyze the dynamics and properties of the stars in the Milky Way's bulge. Collaborating on this study was unusual for Lang -- his expertise is in using computer science to understand large-scale astronomical phenomena, not the dynamics and structure of the Milky Way. But he was able to enter a new field of research because he posted maps to social media and used openly accessible WISE data. "To me, this study is an example of the interesting, serendipitous science that can come from large data sets that are publicly available," he said. "I'm very pleased to see my WISE sky maps being used to answer questions that I didn't even know existed." NASA's Jet Propulsion Laboratory, Pasadena, California, manages and operates WISE for NASA's Science Mission Directorate in Washington. The spacecraft was put into hibernation mode in 2011, after it scanned the entire sky twice, thereby completing its main objectives. In September 2013, WISE was reactivated, renamed NEOWISE and assigned a new mission to assist NASA's efforts to identify potentially hazardous near-Earth objects. Atomic Bits Despite Zero-Point Energy?